Spiced Fig and Apple muesli squares – for breakfast, brunch or afternoon tea. Like flapjacks, but softer and more exotic. 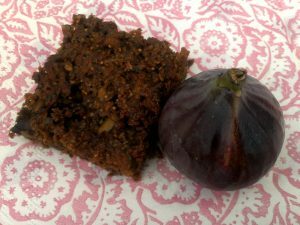 I’m a little bit in love with pan-fried figs right now, and have been feeling like I may need some molasses for extra iron. So when my stepdad gave me cooking apples, this is what I came up with. The amazing list of nutrients in every delicious bite is too long to write here, but they are particularly high in manganese, good for bones, connective tissue, thyroid, digestive and detox enzymes etc. Plus additional bone-strengthening and other benefits from high levels of magnesium, potassium, phosphorous, zinc, B6 and thiamine.